In conjunction with the White House “Astronomy Night” on Monday, October 19th, the STEM Funders Network announced their 5-year plan to create 100 STEM ecosystems around the country. As the Chicago STEM Pathways Cooperative’s ecosystem efforts continue to take shape, these long term plans show the depth of the national commitment to STEM education for all young people. Project Exploration’s executive director Natasha Smith-Walker attended the inaugural Afterschool STEM Summit, September 28-29 in Washington, D.C. Sponsored by Time Warner Cable, the Noyce Foundation, and the Charles Stewart Mott Foundation, the Summit featured several panel discussions and working sessions. As part of the event, the Afterschool Alliance released a new report, Full STEM Ahead: Afterschool Programs Step Up as Key Partners in STEM Education, and announced the launch of the new Afterschool STEM Hub website (www.afterschoolstemhub.org). These resources join the growing body of research around STEM that will be critical in the work of the Coop and peers in STEM Ecosystem Community of Practice. 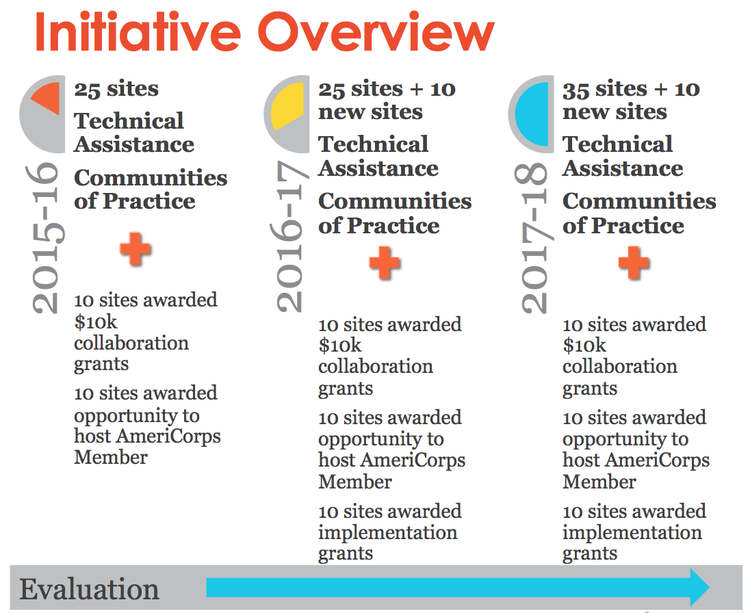 On September 1, 2015, the Chicago STEM Pathways Cooperative was notified that it will join the first cohort of the STEM Funders Network’s STEM Learning Ecosystems initiative. Over 70 applications were reviewed, and 27 cities were selected across the nation. The STEM Learning Ecosystems initiative aims to cultivate a national community of practice, consisting of cities that have STEM learning ecosystems in various stages of development. These cities will develop and share best practices, cultivate strategies for nurturing, measuring, and building city-wide STEM ecosystems, and individually further the work of each city’s ecosystem. Like other cities in the initial cohort, Chicago demonstrated that there already rigorous cross-sector collaborations occuring across school settings, out-of-school time learning programs, funders, policy makers, the business community, institutions of higher education, civic and cultural institutions, researchers, and of course, youth and families. A new report published by the Wallace Foundation provides useful information for all of us who are working to build a citywide STEM ecosystem. The report, “Growing Together, Learning Together” highlights best practices, essential elements of healthy afterschool systems, considerations for choosing data management systems, and examples from various cities.